Jet Theriac, a former portfolio manager at Hutchin Hill Capital, is starting a new hedge fund in San Francisco. Theriac plans to launch the fund, Lanternback Capital, with between $US100 million and $US600 million in January 2018. The fund plans to run an energy, industrials and utilities stock-focused investment strategy. The fund is starting to take shape, with Morgan Stanley doing prime brokerage and capital introductions, and another partner joining from a multi-billion tech hedge fund. Theriac left Hutchin Hill earlier this year, where he oversaw a long-short equity team investing in energy and utilities, Business Insider previously reported. 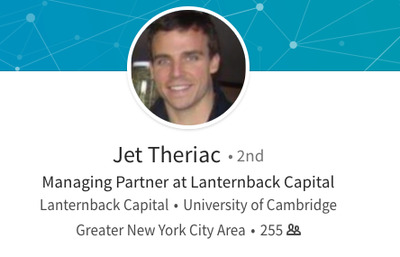 Theriac previously worked as a portfolio manager at Balyasny Asset Management from 2012 through 2015, according to his LinkedIn page.